PARANORMAL investigators claim to have rumbled a top-secret Ministry of Defence (MoD) alien research centre hidden deep underground in a UFO hotspot. The British Earth and Aerial Mysteries Society (BEAMS) has released a bizarre 109-page report, following a “special investigation” into the former MoD Defence Evaluation and Research Agency site now run by specialist defence, security and aerospace developer Qinetiq. 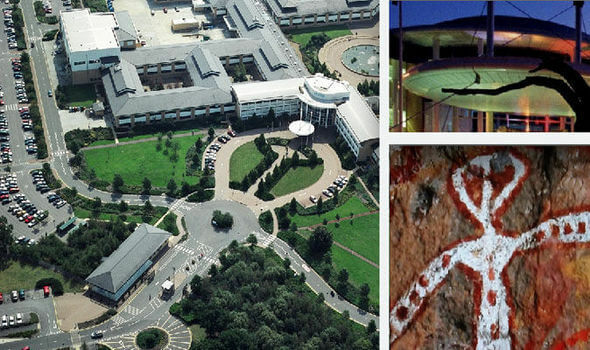 BEAMS claims Farnborough has had high UFO sighting and alien abduction activity for years and thinks this might be connected to the alleged secret base. The group is convinced there is as much underground as above and what goes on there involves aliens, UFOs, intergalactic defence and futuristic flight development. Their bizarre theory is based upon cryptic alien symbols they have “discovered” within the site, alleged intelligence service whistleblower testimonies, and the responses from psychic researchers, the report claims. The BEAMS website says it was set up in 1991 as as a non profit-making studies group into the paranormal. It said: “We have set up a network of active investigators who relay their gathered information through to our HQ. Two of its key researchers, chairman Kenneth Parsons and his “alien abductee” partner Hilary Porter, carried out the “inquiry” and said evidence of the underground areas came from government whistleblowers. But they said the smoking gun evidence for the secret base were cryptic signs in the building and on site. The couple concluded that part of the site’s road system has been made to look like an alien being depicted in ancient Aboriginal paintings in Australia, as a sign of the base’s significance. On top of this they said part of the building has been made to look like a flying saucer. The pair claimed the Qinetiq site was the biggest of three secret underground facilities, also in the UK, including two other suspected ones. The couple said the Cody technology park was also under tight security with armed guards and secret cameras. But the clincher, in their opinion, was the roundabout system near the main building. They surmised that the powers behind the site were confident the public would never see through their cryptic code, but “those” who needed to would recognise it instantly. Besides, if the roundabout did not do the trick, there was more. The couple concluded the roof and canopy of the main building had purposely been designed in the shape of a flying saucer just to hammer home the purpose of the secret base to those in the know. They said the existence of the “underground” parts of the site described by “sources” were further proved by Qinetiq’s involvement in mining coupled with a strange rumbling noise they allegedly heard a cross Farnborough over the last 15 years, which they deduced was it being secretly expanded. Three so-called psychic remote viewers given the name of the site, but no more details, as part of the research, also came back with descriptions of a highly technological and disturbing underground base, they claimed.Not convinced? Neither are some other UFO investigators. But he added that “the idea” of alien or flying saucer bases being underground was “nothing new”, dating back to at least 1962, when Albert Bender, founder of the International Flying Saucer Bureau (IFSB) in Bridgeport, Connecticut, claimed that alien beings took him to an underground HQ in Antarctica. Express.co.uk contacted Qinetiq to comment on the strange suggestions and awaits a further response.